Flyer of the symposium at FU. From 7 to 8 February, 2019 will take place the International Symposium on political violences and gender at FU Berlin. 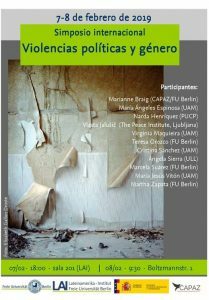 The event is organized by the CAPAZ Institute, the Institute for Latin America Studies (LAI) at FU Berlin and the research project at Universidad Autónoma de Madrid entitled “Violencias políticas y género: imaginarios, escenarios y resistencias”. Download the academic programme (in Spanish).